This month, I asked to observe two Pharmacy classes I had heard about, Pharmacotherapeutics and Advanced Therapeutics. Both classes are taught by Dr. Michael MacEvoy, clinical assistant professor and director of experiential education in our School of Pharmacy. Today’s pharmacists act as part of an integrated healthcare team, educating patients on the use of both prescription and over-the-counter medications, advising physicians and other healthcare professionals on the best use of therapeutic medications, and offering advice about drug interactions and side effects. All of this was emphasized in both two-hour classes I observed. The first class I observed was Pharmacotherapeutics, which took place in a DAC lecture hall. 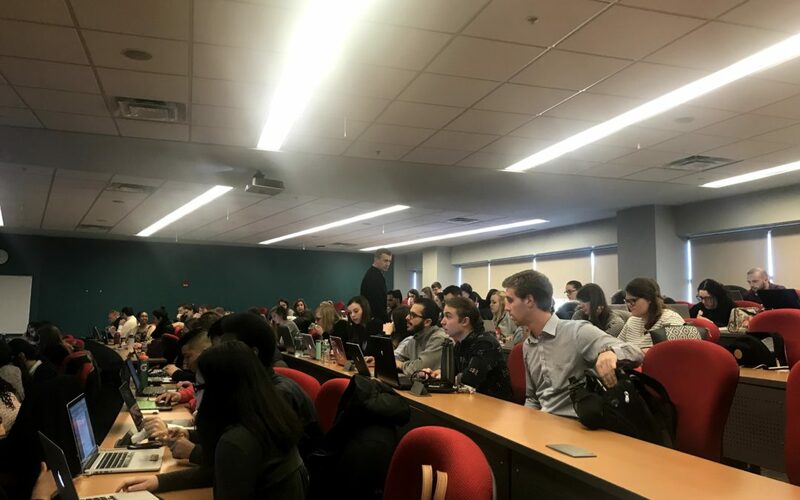 The class had around 65 students in it and employed the help of two additional teachers, Dr. Courtney Cardinal and a fourth-year student, Andrew Bless. Dr. MacEvoy, Dr. Cardinal and Andrew Bless have been collaborating this semester to carefully craft each lesson. The first part of the class involved students reviewing the file of a diabetic patient. 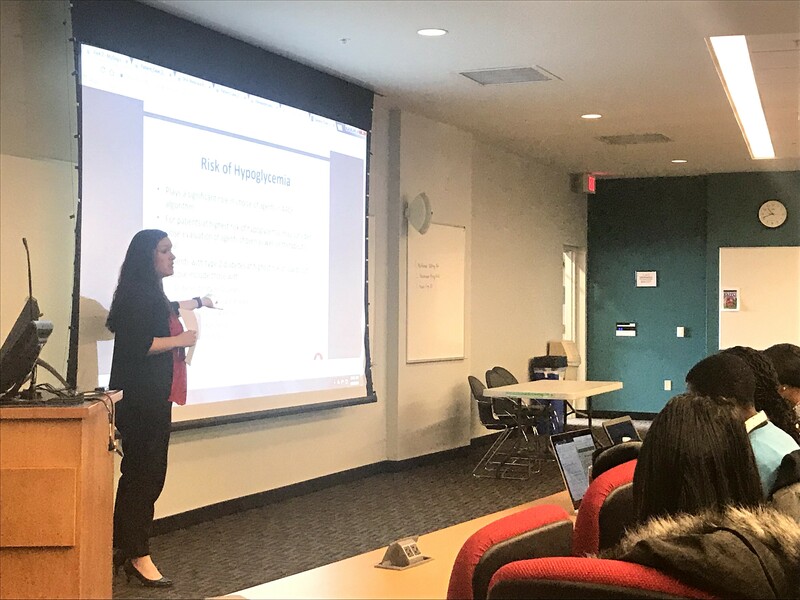 First, Dr. MacEvoy asked students to partner up with the person next to them to review the patient’s file using the five standards of care covered the class prior. Then, students were invited up to write key points on the board and the class debriefs through discussion. 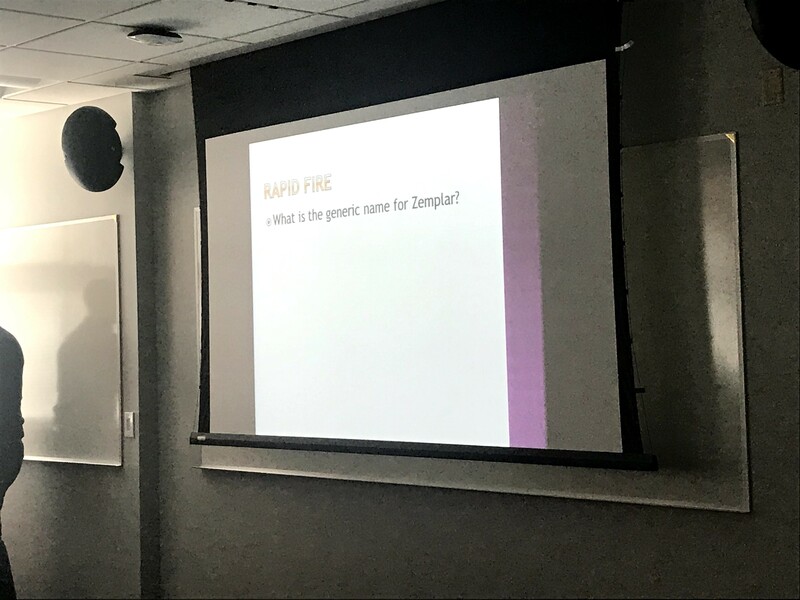 Before the next part of the class, the instructor and TAs (in this case a Pharmacy Resident and Intern) walked the room to answer questions that individual groups had, while the rest of the students continued to discuss the case. Dr. Cardinal then covered the ADA Standards to Diabetes Care and AACE Type 2 Diabetes Management Algorithm, developed by the American Association of Clinical Endocrinologists and American College of Endocrinology, pausing every so many minutes to ask students about certain prescriptions or conditions. For those of us laypeople, I would describe the algorithm as a series of “if/then’s” you can run a patient file through to determine which medications are best for their lifestyle and situation. While many colleges might teach this content in a way that offers the information in piecemeal chunks, Dr. MacEvoy and his team believe in delivering the information in a way students can expect to see it delivered on the job. Additionally, some memorization is important because pharmacists don’t always have time to look up terms. 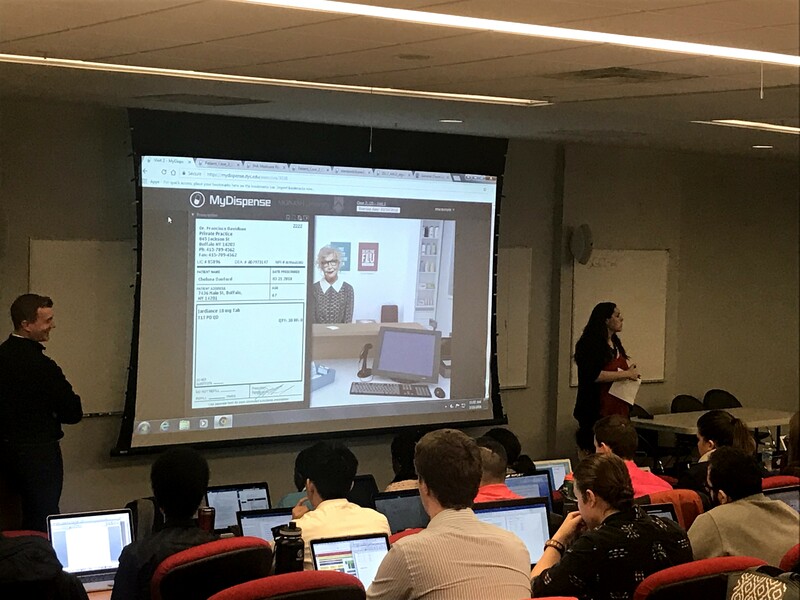 This class is noted for utilizing MyDispense, an online pharmacy simulation that allows students to develop and practice dispensing skills. It provides a safe environment in which students may make mistakes without experiencing the serious consequences of practicing in the real world. In the last part of the class, the team brought “Chelsea” to the simulated counter. Chelsea was an avatar of the patient’s file we reviewed earlier in class. The class had a chance to ask Chelsea questions and to call her simulated doctor about the prescriptions he assigned her and the side effects she is not dealing with. After the phone call, the class was able to click on the script and dispense to Chelsea a new form of medication. 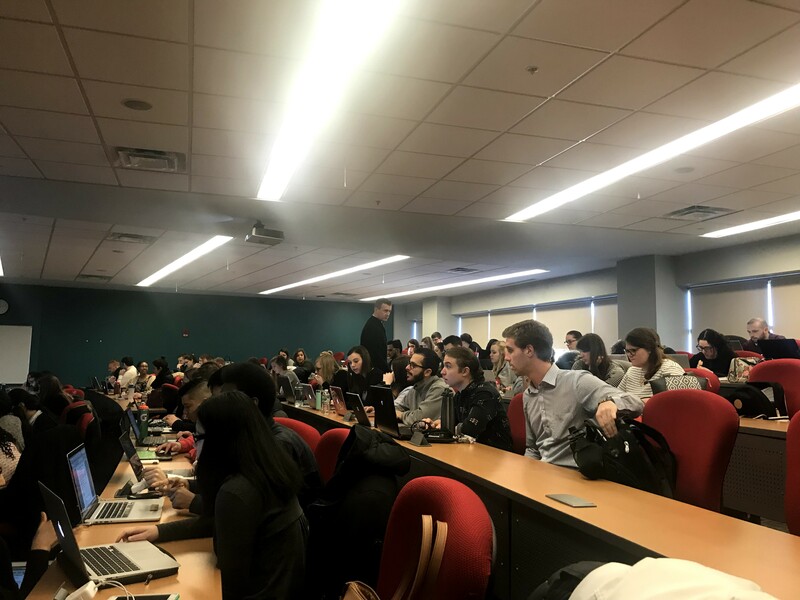 When Chelsea starts to ask questions of her own, students around where I was seated used their laptops to search journal articles, the AACE Algorithm, and their notes. The second class I observed was Advanced Therapeutics which took place in a DAC U-shaped classroom. The class had around 15 students in it and employed the help of an additional teacher, Dr. Adinoyi Garba. Dr. Courtney Cardinal and Andrew Bless were also present to help. The first part of class focused on case studies and new research on medications. The second part of class utilized a buzzer system. 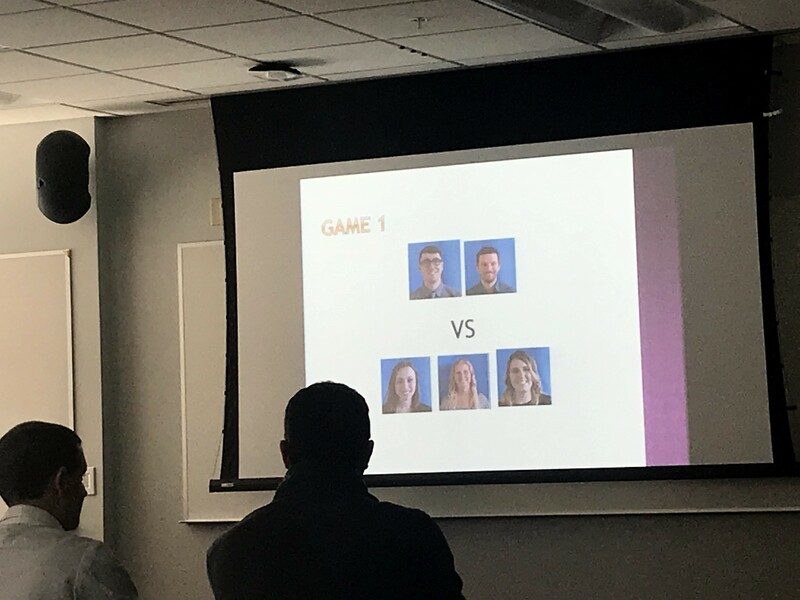 Students took turns competing against one another in teams to buzz in answers to a jeopardy game complete with bonus rounds. As much as they loved pressing the buzzer, they were also very competitive about the points being added or subtracted on the white board. Dr. MacEvoy is a faculty member who employs technology and strategic teaching methods to engage students in complicated concepts and terminology. He encourages students to see the relationships between elements and to dive deeper into the content. Part of his strategy, however, involves the help of others and encouraging students to be a part of the learning experience. Use a piece of information to ground the class. The Pharmacotherapeutics class started and continued to come back to the same patient’s file to ground the conversation about standards and terms. As the file allowed, pieces of information can sometimes preview where the class is headed. Partner students up. Even while not placed in formal groups, students in Pharmacotherapeutics were able to discuss the file with the person next to them. 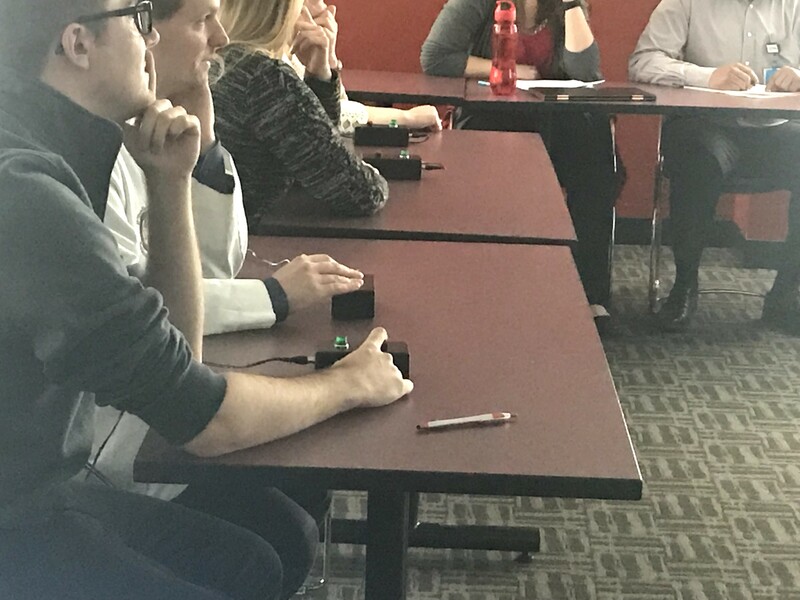 Students in Advanced Therapeutics also enjoyed playing the buzzer game and competing in groups. Discuss the questions. Students in both classes asked questions pertaining to, but sometimes challenging, the data. “Wouldn’t we prescribe X because of the high blood sugar?” or “Why would we prescribe X over X?” These are high level questions that get the class engaged and discussing the possibilities in a low-stakes environment. Provide the resources. 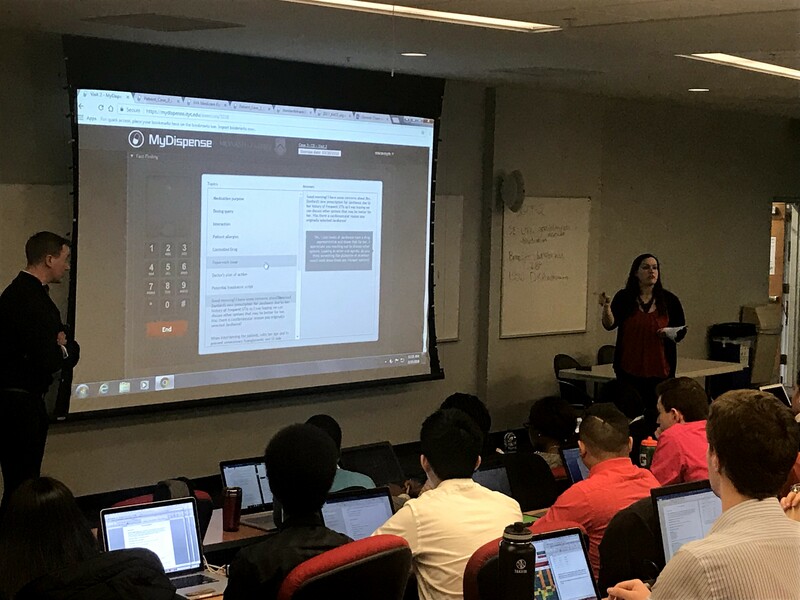 When interacting with the patient in MyDispense, students were able to refer to a wide range of content including journal articles and the AACE Algorithm posted in Canvas. Play games. The students in Advanced Therapeutics had a fun time engaging the content in the jeopardy game. Break the class time into units. Both Pharmacotherapeutics and Advanced Therapeutics were two-hour long classes. Breaking the classes up into 3-4 parts provided an opportunity for students to refocus on the next piece of content and activity.